Apple iPad (6th generation) comes with top-notch A10 CPU and it is also the 1st generic Apple tablet to support Pencil stylus. Read to know the price and launch offers. Apple iPad (6th generation) had made its global debut in the US last month, and now, it has finally arrived in India. The new iPad (6th generation) is available both on e-commerce sites and also at brick-and-mortar stores across the country. It comes in two models—Wi-Fi only and the LTE + Wi-Fi. They also come in two sub-variants—32GB and 128GB—with prices ranging between Rs 28,000 and Rs 46,300 [complete price details in the table below]. As part of the launch offer, Apple is offering the iPad (6th gen) with Rs 5,000 discount on all models for consumers using ICICI credit cards. Is it worth buying Apple iPad (6th generation)? Considering its spec-sheet, Apple's new iPad is best in its price segment. It sports a 9.7-inch screen high-resolution Retina Display technology with a FaceTime HD snapper on the front. It also flaunts high-grade metallic shell and a decent 8MP primary camera on the top left corner. It comes with a high capacity battery capable of running for close to 10 hours of surfing the web on Wi-Fi, watching a video or listening to music. The new iPad is powered by Apple's proprietary A10 Fusion chip with 64‑bit desktop-class processor architecture.It is said to be 40 percent faster CPU clock speed and 50 percent faster graphics performance for seamless multitasking and graphics-intensive apps compared to the previous edition. With such top-end system configuration, it is guaranteed to perform smoothly with any graphics-rich Augment Reality apps and games. Another praiseworthy aspect of the new iPad is that it is the first generic Apple tablet to support Apple Pencil. 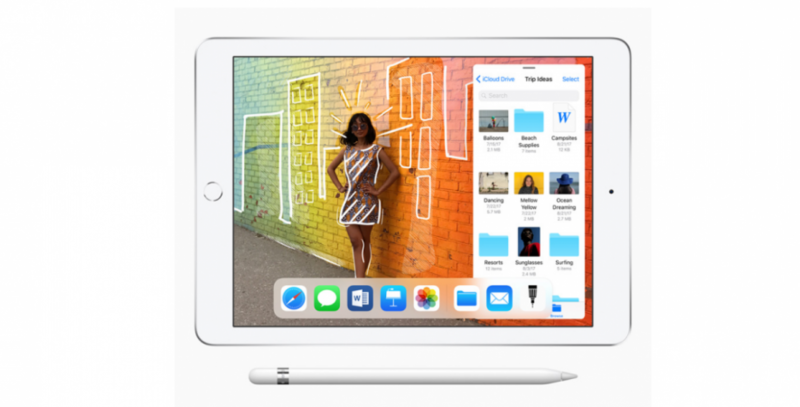 The Pencil was first introduced only for iPad Pro series in 2016 and the versatile tool was popular among students, professionals, and creative animation artists and is now available to even more consumers. Apple Pencil is remarkably fluid and offers natural drawing experience. It comes with advanced sensors measure both pressure and tilt, and provide pixel-perfect accuracy and low latency for activities from note taking to the illustration in apps like Notability, Pages, Numbers, Keynote and Microsoft Office. Apple iPad's palm rejection technology even makes it possible to rest your hand on the screen while you use Apple Pencil, the company claims. Considering the price and specifications, it's worth investing in the new Apple iPad (6th gen). To make it more clear, the Apple device is the best in the premium tablet class, which fall under the price-range of Rs 25,000 and Rs 50,000. Smart Covers for iPad are available for Rs 3400 in charcoal grey, midnight blue, (RED), white and pink sand at Apple Authorised Resellers. Follow us @IBTimesIN_Tech on Twitter for the latest news on Apple products.